Medallion is crazy over the top! Wow, I'm speechless. It is gold glitter densely packed in with larger holographic hex glitter. Well, these pictures will explain better than any words I type. I did not photoshop any of these, they are just that intense! Even indoors the hex glitter changes colors like that (minus the sunlight flare). You must click to enlarge to see it's full glory! I have to show you a few shots outdoors so you can see all the colors it turns into! 3 coats and it was pretty bumpy so 2 coats of Seche Vite smoothed it out. The boring indoor shot (is actually not so boring! ), but look it's even colorful indoors no flash! If you can find this, it's a must-have! Wow! That's utterly fantastical! I NEED THAT!!! This is beautiful!!! I love it. Is it a new polish? I agree! You have to get it! Thanks, I love it so much! 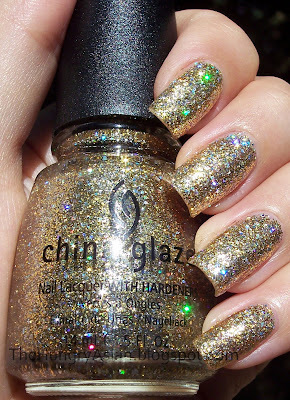 It is one of ChG's new glitters that came out recently. It is amazing hope you can find it! That glitter has me drooling! Thank you, I'll be on the look for those. This one is fantastic! I WANT THIS NOW!! !Oh, damn I need my bank card which I haven't gone to get. How beautiful is that polish. I want every one of those new glitter polishes. Your nails look tremendously beautiful and shiny! This is one for the fainting couch! Where did you purchase this cosmic loveliness? I would enjoy temporarily blinding the greater tri-state area while out for a jaunt. I need that glittery sweetness like now! wow, that is simply amazing! Wow! Amazing :) hope to see the other glitters soon. wow! I'm speechless... it IS a must have! 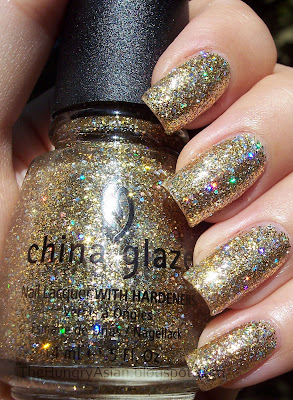 and I'm not a gold-glitter big fan - but this one is just gorgeous! WoooW!! What a beautiful nail polish!! The glitters are so magical!! 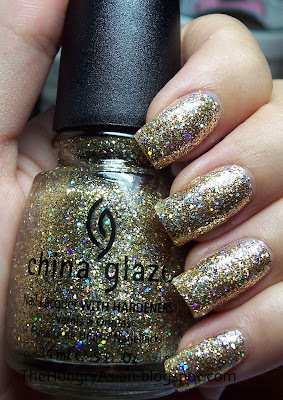 Now I have to do China Glaze research(^-^) so that I can get the same one!! Thank you for sharing!! That's some serious bling bling! oh wow, i had to take it off last night because of so many layers (2 seche vite bleh) it peeled at my tips. Well anyway it was a mess to take off. lol well we all know it will be hard, but I say it was soo worth it! np, check Sally Beauty if you go local! lol :D oh you still having that bank card problem, what a bummer! I hope you get it back soon :) Thank you for your nice compliment! haha I almost did that in my chair! Sorry for the late reply, I got mine at Sally beauty! hi there! You must have sold a bajillion kanzashi by now! well that is a bummer your glue messes up polish, but you can always paint your toes! haha yes, even my husband said it was ridiculous! I love these glitters! They are so WOW! Wow, this amazing even better than the OPI! I love this one! Gold is not such a great look for me, but is WOW on your stunning nails! oh Kae, you always make me envy your NP's *sniff* ahhhhh I want them!!!! This is going straight to my "to buy" list! The glitter looks great! The look just as good as rockstar nails ( gel nails w/ glitter). Valerie - yeah I always buy silver (jewelery, glitter, anything) but gave t his a shot since I don't have any gold. It turned out ok! Alexlyndra - haha, it's worth it! Ooooh - This looks so gorgeous on you! I can't wait to wear the one I got, now! thanks, sally's has them in stock! 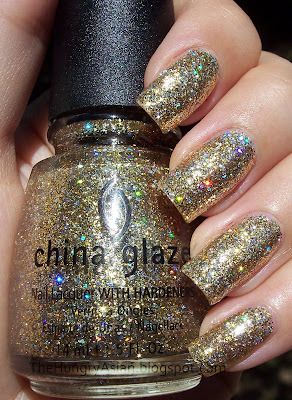 i googled china glaze medallion and came here. my god. i want it now!!! have you tried other np's from this series? Alien man - hi there, nope I haven't gotten any others but I can't wait to get more, h2t has most of them I think!